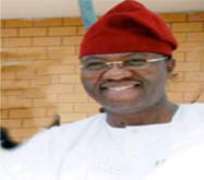 All seem not to be well with Ogun State People's Democratic Party chieftains as some of the key cabinet members could no longer cope with the antics of the present Governor of Ogun state, Otunba Gbenga Daniel and have however decided to throw in the towel one after the other. This time around it is the State Commissioner for Information and Orientation Hon. Kayode Samuel. Some of the State indigenes have alleged that Gbenga Daniel has been involved in series of financial misappropriation, and money laundering activities which his cabinet member often frown at. Anonymous sources revealed that His Excellency sees every other person in the State as stooges to him and their contribution doesn't count. Besides, the incumbent Governor is equally involved in all sorts of fetish activities like forcing his cabinet and Assembly members to taking oath at different shrines in Ijebu part of the state. Kayode Samuel was also said to have denied his resignation several times having being threatened by Daniel's killer squad. Classified information from a source close to the government house in Abeokuta further revealed that more resignation will still be made in Gbenga Daniels cabinet. And that the Governor places them on many severe conditions which some of them cannot meet and which also do not go well with their varying religious believes. Almost simultaneously, the Ogun State government has accepted the resignation of the former Commissioner for Information and Orientation Kayode Samuel. No specific reasons were given for the commissioner's resignation, but a statement on Wednesday by the Secretary to the State Government (SSG), Mr. Adegbemi Onakoya said government noted that the former Commissioner had suffered bouts of frustrations while his tenure as a cabinet member lasted. The statement revealed: "We received the notice of resignation of Mr. Kayode Samuel, Commissioner for Information and Orientation. Mr. Kayode Samuel was a very intelligent cabinet member whose quality contribution will definitely be missed. "On several occasions, he expressed frustration for belonging to a profession where standard and credibility have fallen abysmally. We wish him the best in all his future endeavours." This recent shock was coming when a similar scenario was witnessed by the state in less than two weeks (Sept 1) when a former Commissioner and now a member of the state government owned Gateway Oil and Gas Company Board; Mrs. Doyin Ogunbiyi tendered her letter of resignation from the board under unclear circumstances. Mrs. Ogunbiyi had first been sacked as Managing Director of Gateway Tourism Development Corporation during the face-off between Governor Olugbenga Daniel and the Alake of Egbaland, Oba Adedotun Gbadebo before she was appointed member of the Oil and Gas Company. The Alake had drawn the attention of Governor Daniel over his comments on the deplorable roads of Abeokuta. Mrs Ogunbiyi resignation was not unconnected with the face off between Daniel and some elders of the ruling party, PDP.